On this page and the next I will discuss 11 topics, (1) the timing of the Jewish day, (2) observance of the Sabbath, the land Sabbath, and the Jubilee year, (3) the Torah-defined start of the year, (4) synagogue worship, (5) the kosher laws, (6) Passover laws, (7) taking the name of the Lord in vain, (8) my observations regarding the Book of Job, (9) our relationship with God and the world, (10) converts to Judaism, and (11) a subject not pertinent today, but important for understanding who was permitted to enter the holy places of the Tabernacle while it rested in any one place (as well as the holy places of the Temple). The discussions in Parts 2, 5, 6, and 9 are an unfinished work in progress. For example, the sections on Jewish customs and our relationship with God are not yet complete. Notice that sections (6), (7), (8), (9), (10), and (11) are on a separate page, Judaism 2. All my remarks are based on and centered in a Torah requirement that in my opinion is vital: That is the requirement that we do not add to, take away from, or otherwise distort the commandments of the Torah, as we are instructed in Deut. 4:2 and 13:1. As I mentioned in the introduction, I understand that God tells us in the Torah the Jewish day does not start at sunset. The facts are subtle and require explanation before the truth is revealed. So I will quote and discuss six sections or passages in the Torah that have convinced me that the traditional time for the start of the Jewish day is incorrect. I refer first to Exod. 12:18. However, I also include Exod. 12:6 and 12:8 as they are referred to in the ensuing discussion. Exod. 12:18 In the first month, in the month’s fourteenth day, in the evening, you shall eat unleavened bread until the month’s twenty-first day, in the evening. The meaning and intent of verses 12:6 and 12:8 are clear. The “dusk” referred to in the first verse is that occurring near the end of daylight on the 14th day. And likewise the “night” referred to in the second verse is also after the end of daylight on the same day. and possibility (2): Each day does not start in the evening and the Lord is instructing us to eat unleavened bread at the end of daylight (evening) on the 14th day until the end of daylight (evening) on the 21st day. With possibility (1), we would be eating unleavened bread at the start of the 14th day. This conflicts with the wording of vss. 12:6 and 12:8. Therefore, it can’t be the correct conclusion. With possibility (2), we would be eating unleavened bread at the end (evening) of the 14th day. This is obviously the correct conclusion for understanding the ramifications of this verse. As a result, v. 12:18 gives us one of the strongest arguments for the day not starting in the evening. If it starts in the evening, the holiday starts on the fourteenth day, not the fifteenth. As I see this result, the day, in recognition of the first act of Creation, starts with first light, just before dawn, and ends immediately before first light of the next morning. The day is 24 hours long. I refer next to Exod. 29:38 and 39. The Lord is instructing Moses. Dusk is the period before darkness. It is the time of evening. Then if one sacrifice is offered in the morning and one in the evening, they must be of the same day. Thus -- again -- the Jewish day cannot start in the evening. This verse provides additional support for my contention that the day doesn’t start in the evening. Why would the Lord say half of the meal offering should be presented in the morning of the day of anointing and half in the evening? If the day started in the evening, He is saying that the second half of the meal offering should be presented in the evening before the anointing and the first half in the morning of the day of anointing. Why would the meal offering (the second half, no less) for the anointing take place the evening before? It makes no sense. As I see it, the Lord is telling us in this verse that the day of anointing doesn’t start in the evening. Now I call Levi. 23:32. This verse, referring to Yom Kippur, provides very convincing support for the Jewish day not starting in the evening. Here’s the reasoning behind it. Yom Kippur is on the tenth day of the seventh month (first found in Levi. 16:29). If the ninth day starts the preceding evening, God would be telling us in this verse to observe the ninth day, not the tenth. So the evening of the ninth day must be that evening, not the preceding evening. If the evening of any day is at (or shortly after) the subsequent sundown, it cannot be the start of the next day. It must be the end of only the daylight hours of that very same day. So when might a 24-hour day start if it doesn’t start near sundown? As there were no clocks to signify time during the night, the day logically should start with first light, which means to me that every morning, in the moments before dawn of a new day, we encounter a continual reminder to us of God’s first act of Creation. Of course, dawn could also signal the start of the day, but I suspect this would be incorrect as it could encourage sun worship, which is warned against in Deut. 4:19. But now we have to ask another question raised by this verse. If the day starts in the morning, why would the Lord tell us to afflict our souls from evening to evening, and not from morning to morning? The answer is partly rather obvious. If fasting is a main aspect of afflicting our souls, then according to this verse, we would be fasting from the previous evening (the evening at the end of the ninth) anyway. When we awake in the morning, it’s already the tenth day, so we cannot eat or drink then. Finally, I believe that the Lord is demonstrating His compassion to us here by telling us that 24 hours of affliction is enough.. If we were to have to retire without eating or drinking after fasting all day on the evening after the tenth day, we would be very uncomfortable during the night. For many people this might even be dangerous and life threatening. Moreover, sleep that night would be extremely difficult, aggravating the discomfort of hunger and thirst and their danger. I know from experience what that means. When I first accepted my belief that the day started in the morning, it was a short time before Yom Kippur. I decided I’d follow my belief and fast until the next morning -- a full 36 hours. That night, sleep was not impossible. But I tossed and turned almost all of the night, waking frequently and feeling quite uncomfortable. At those times the gnawing in my belly was actually painful. Now the Lord tells me in this verse that such discomfort is not necessary. God may not appreciate excess in our “good” behavior, even if it’s inspired by our love for Him. Next I call Numb. 9:15. Numb. 9:15 And with the day of erecting the Tabernacle, the cloud covered the Tabernacle in the tent of the testimony, and in the evening there would be like an appearance of fire over the Tabernacle until the morning. This verse provides some additional corroboration of my thesis that the day starts at first light rather than in the evening. The day of the erecting of the Tabernacle could not have included the previous evening (the traditional start of that day) because then the pillar of fire would have to have appeared before the erecting of the Tabernacle. As soon as the Tabernacle was erected, the cloud apparently covered it immediately (or soon thereafter). Then when evening arrived, the appearance of fire was over it. Finally I call Numb. 33:3. Here Moses is beginning to recount the journey of the Israelites following their exodus from Egypt. Numb. 33:3 So they departed from Rameses in the first month on the first month’s fifteenth day. From the day after the pass over the children of Israel went out with a high hand in the sight of all the Egyptians. Here is additional strong support for the Jewish day starting at morning, not in the evening: The fifteenth day is referred to by Moses as the day after the pass over (referring to the passing over of the angel of death), which had occurred the previous night throughout Egypt. If the fifteenth day is the next day after the pass over, it is a different day from the previous night. Thus the evening must be the end of the daylight hours, not the start of a new day, the actual end of the day being just before the start of the new day, which is, as I’ve remarked earlier, probably the moment of first light to remind us of Creation. Before saying farewell to this discussion, we should briefly examine the basis for the tradition that the start of the day is the evening. The sages and rabbis point to Gene. 1:5, where it says “And it was evening and it was morning, period [day] one.” They point to the arrangement of the words, the evening coming first. In my humble opinion, this is a rather weak argument, since the arrangement of words in a biblical Hebrew verse often appears seemingly quite arbitrary. There are at least seven other examples of verses in the Torah where events in time are described inverted in the Hebrew. Another aspect to the argument put forth by the foregoing scholars is that the act of Creation supports the day starting in the evening. They ask, was it not dark before God said “Let there be light?” First there was darkness; then there was light, they say. Unfortunately, in actuality, this last statement exhibits a logical error in the context of Creation. I have to ask a simple question or two of those who believe Creation started with darkness. How could it have been dark before the light? What is darkness without light? What does darkness mean? Let me explain what I’m getting at. Darkness is not a thing. It is the contrast with a thing, that thing being light. Darkness is defined by light. Before there was light, there was no darkness, no evening -- only God. When God said “Let there be light,” He created not only light but darkness as well. At the same time! Darkness exists only because light exists. Before there was light, there was no darkness; there was “nothing” besides God. Before we leave this important topic, we might look at the possible situation in ancient times from a totally different perspective. Suppose the timing of the day had already been established when the events of Genesis and Exodus were recorded -- actually considered by many as most likely. Under this assumption, the going practice and understanding would have been that a day started in the evening. If that were the case, it would explain why the scribe(s) would record the happenings of these books as they were recorded. However, then we must conclude that the scribe(s) was (were) not too smart and made a terrible error in the above six verses, having no idea of the hidden consequence of their words. This is certainly a possibility that cannot be reasonably refuted, but I give the scribe(s) more credit than that. As I’ve already stated elsewhere (rubinspace.org), I believe that the scribe(s) thought the events and instructions and commands he (they) was (were) recording had come directly from God (through an intermediary perhaps) and were sacred. Why would the scribe question what he was recording? It seems to me he would have questioned only if he was a passionate cynic or impassioned skeptic. Certainly he (they) was (were) neither. Whatever the case, established tradition or no, this perspective does not settle or alter the controversy. The preponderance of the argument, as identified in these six verses, however, rests with the day not starting in the evening. To summarize, six very convincing pieces of evidence point to the Jewish day not starting in the evening, and only a weak and fallible argument can be raised for the day starting in the evening. I rest my case. If we were to accept the conclusion that the Jewish day does not start after sunset, we would need to reconsider the timing of the Sabbath, holidays, and festivals. But before we consider the timing of the Sabbath and its implications, I ask and address the following questions. How may we observe and keep the Sabbath? What may we do and what must we refrain from doing? The sages of the Talmud addressed these questions with vigor and in great detail. I believe we need to examine the Sabbath laws ourselves as revealed in the Torah, for they are few in number, in order to derive a clear understanding. What does God tell us about observing the Sabbath? It turns out that the directions for Sabbath observance in the Torah are revealing in what is not said as opposed to what is said. Other than one or two verses that repeat what we have here, the following few (nine or maybe eleven) examples represent the entire spectrum of what we are told about Sabbath observance and restrictions. The extent of the instruction goes as follows. Exod. 16:22 And it was on the sixth day, they gathered twice as much food, two omers for each one, and all the princes of the congregation came and told to Moses. In this verse Moses is telling the Israelites that they should bake and boil food for two days (presumably the quail and possibly cakes of dough), and leave the leftovers and the remaining manna for the Sabbath. While these two verses were addressing a temporary situation -- the Israelites’ wilderness experience -- we may learn from them that (1) we are to prepare twice as much food on the day before the Sabbath, and (2) we are not to do any food preparation on the Sabbath itself. Preparation means baking and/or cooking. The two verses taken together reveal to us that we are to bring together food for two days on Friday, cook them, eat what we need that day, and leave the leftovers for the Sabbath. Incidentally, although these verses apply only to the Israelites’ wilderness experience, they imply something more about Sabbath observance in Israel, which I will touch on below in connection with Exod. 34:21. Here we are told that on the Sabbath we are not to do any of the work we do on the other six days of the week. Moreover we must not assign any work to those in our household, whoever they are (although mention of the wife is omitted! ), or allow them to work. This commandment is directed to the entire congregation of Israel as a body, not to its individual members. However, the phrase you or your son or daughter, etc., indicates that neither the individual nor any in the household is permitted to work. However, as the wife is not mentioned, I must presume that she is permitted to perform some of her daily activities. I have to conclude that the Lord does not consider her activities as work that is not permitted on the Sabbath. It would seem to me that only the preparation of food (and probably heavy or tedious labor) is generally not permitted to her or any other member of the household. These two verses and the discussion of wifely duties here also reinforce the idea that work is what we do for our livelihood, how we earn income . The Lord once again reiterates, and emphasizes here, that the Sabbath is for resting from one’s daily work, despite the urgent seasonal pressure to keep working, especially at planting and harvest time. But because nothing may be gathered for food on the Sabbath, no one may even enter the field to gather up something that might have been forgotten the day before. If one is reverently observant, he will not forget. Everyone will diligently and joyfully make sure that all is prepared for the pleasure of the Lord’s Sabbath. Also because of Exod. 16:22 and 16:23 (addressed a ways back above), no one may enter a field on the Sabbath for any purpose other than to pass through. However, on passing through, one may, if hungry, pick a vegetable or fruit to eat. One may not glean. Very interesting! The sanctification is to continue for seven straight days. That includes the intervening, beginning, or ending Sabbath (depending on which day of the week the process was started). Such holy activities were not suspended on the Sabbath. That is rather significant. God doesn’t consider the sanctification process during the six weekdays to be work. `~lA[ tyrIB. Laerf.yI-ynEB. Taeme dym_iT hwhy> ynEp.li WNk,r>[;y: tBV;h; ~AyB. tBV;h; ~AyB. In these two verses, Levi. 24:8 and Numb. 28:9, we have corroboration that the service of the Tabernacle/Temple was not to be suspended on the Sabbath. Once a week, on the Sabbath, the showbread should be prepared, and the daily offerings of the people were to continue to be brought to the Tabernacle. By the way, this implies that the people were permitted to leave their habitations on the Sabbath (for more on this, see the discussion on the next verse I quote). Now we turn our attention to what I consider two misinterpreted admonitions, Exod. 16:29 and Exod. 35:3. In the first of these Moses is speaking to the children of Israel on the day before the second Sabbath following the appearance of manna. In Exod. 35:3, he is addressing them on the eve of their starting to work on the Tabernacle and tent of meeting. Is Moses adding here a perpetual prohibition against leaving one’s tent on the Sabbath, or is he saying simply that the people were not to go out to search for manna? I submit that the answer is the latter. If it is the former, it would be an addition to the law by Moses that we are not told that God had commanded (it would also conflict with Numb. 28:9 above). It would seem that Moses had no faith in the people’s obedience, and added a prohibition that might prevent them from disobeying God’s actual command, that is, not to gather. A fence around the Sabbath commandments, so to speak! Elsewhere I shall address Moses’ obvious distrust of the Israelites. But in this case I believe Moses was distrusting only their resolve to refrain from gathering or examining the manna or satisfying their curiosity and disbelief that manna did not fall on the Sabbath, i.e., their lack of faith. He had good reason to be distrusting, as we find out in the next paragraph. In Exod. 35:3 below we learn that Moses again appears to be expanding another of God’s commandments, seemingly continuing to build that fence. The example in Exod. 16:29 and the one in Exod. 35:3 have something in common. They both relate to immediate or imminent situations. Here in reference to Exod. 16:29, we are told in Exod. 16:27 that some Israelites chose, perhaps out of curiosity, to venture out in search of the mysterious manna on the preceding Sabbath. So I believe Moses was cautioning them not to repeat their error. For the verse below, Exod. 35:3, we will find a different contextual condition. This verse forms part of the support by rabbis and scholars for the admonition against igniting any kind of light on the Sabbath. But I have some doubts about it, which arise from its placement in this series of Moses’ commands. The admonition precedes the imminent start of labor the next day on the Tabernacle, which would take the better part of a year. And much of that work involved melting, forging, and shaping metals, and would require the labor of many children of Israel. So Moses was likely making sure that he was being understood when he spoke of the Sabbath rest. I believe that this command was added by Moses in the hope of preventing any kind of surreptitious work on the part of this stubborn people. Recall that some of the Israelites went out to gather manna on the first Sabbath after its appearance (Exod. 16:27 to 16:29). As far as we know, this command to not kindle a fire was never mentioned by the Lord. Therefore, I don’t believe that the prohibition against causing the lighting or dousing of any light is intended to be perpetual. It was situational. However, as I see it, there is a part that is perpetual; that is the prohibition against doing anything on the Sabbath that is in any way a part of one’s daily work. To say it simply, if your daily work includes lighting a fire, then you may not light a fire on the Sabbath. I believe that is the intention of this verse. In Numbers 7, which is the longest chapter in the Torah, we encounter strong evidence for my contention that the prohibitions expressed in the above two verses are being addressed to the people for these respective circumstances only and are not a perpetual prohibition. In that chapter the chiefs of the Israelite tribes, and quite possibly some of their servants, came to the Tabernacle (from their habitations) to present their offerings for twelve straight days, a period which had to include one or two Sabbaths. This evidence casts a good deal of doubt on many of the Sabbath restrictions that the sages and rabbis have derived from these two verses. All of the present-day Sabbath restrictions come out of the Talmud and subsequent judgments by rabbis. But in my humble opinion, the sages of the Babylonian exile and the Talmudic sages went far afield of God’s intention. In their effort to avoid any possibility of transgressing God’s commandments and therefore angering God, they built in safeguards not strictly specified in the Torah, the so-called fence around the Torah. Their interpretation of Torah verses and portions of verses was so elaborately restrictive that they and later generations of scholars were forced to add numerous prohibitions, permissions, and workarounds to fulfill their detailed requirements. An ideal example of this is the so-called “eruv,” an enclosure, often simply a wire, completely and continuously surrounding a neighborhood, that permits the inhabitants to get around some assumed Sabbath restrictions. As I see it, this practice of the scholars, which must have started during the Babylonian exile following the destruction of Solomon’s Temple in 586 BCE, inadvertently violated Moses’ admonition against adding to or detracting from the Torah, as relayed to us in Deut. 4:2 and 13:1. I don’t believe there are many verses in the Torah that are this clear and unambiguous. Moses is telling us not to add any words or laws or take away any words or laws. What could be simpler or plainer than that? Yet that is precisely what we have been doing for 2,500 years. I believe we must firmly adhere to these words and acknowledge Moses’ warning. Therefore, I have tried to interpret what the Lord has told us as exactly and as simply as is possible so as not to violate the letter or the spirit of the message of Deut. 4:2 and 13:1. However, rabbis and observant Jews have a different opinion, and they discount my liberal interpretation of these two verses. They claim that they have not violated these commandments. They ask, “Where have we added anything?” The Torah is the same as it was 3,000 years ago. having been reproduced over and over by diligently copying it letter by letter. in other words, they refuse to acknowledge the spirit of the words, only what they acknowledge is an amazingly distorted literal meaning. I have to go my own way in this. No one else to whom I’ve mentioned this -- including rabbis and learned Jews -- is willing to see what is happening here. The words of these verses very clearly mean to not add any new commandments, statutes, or ordinances, or to remove or ignore any. a. May we create on the Sabbath? In answer to this question, I have to ask one. Can we create at all at any time? I think the answer to this question is NO. Only God can create. We may try to imitate God, but we do not create -- that is, make something physical out of nothing physical. We alter, we convert, we modify, we put together, we pull apart. But we do not create. When we kindle a flame, we are converting mechanical energy into visible and thermal energy. When we turn on a light, we are converting electrical energy into visible energy. When we open a refrigerator door, we do not create light inside it. When we press a remote button and turn on power to a radio or TV, we are not creating a spark; nor are we creating sound or a picture. We are converting electrical energy into mechanical energy (sound) and visible energy (picture). When we conceive a child we are not creating life. We are providing already live organisms produced in our bodies the opportunity to mingle and thereby induce cell division, managed and controlled by the DNA from both original organisms. Incidentally, the so-called Sabbath refrigerator lamp is an ideal example of the frivolous work-arounds introduced by well-meaning rabbis. It’s true that a Sabbath refrigerator lamp is on all the time, so that when the door is opened light is not created (in the more liberal meaning of create) -- but that is only inside the refrigerator. Outside the refrigerator light has been “created.” If the kitchen was dark before the door is opened, it is now light. Jews ignore this “trivial” observation. But by doing so, I believe they are ignoring God as well. Some may argue that my definition of creating is too restrictive. After all, doesn’t creating also mean transforming something into something else that did not previously exist? The light in the refrigerator was not there until the door was opened. So it was created in this latter sense. Certainly one may therefore presume to not open a refrigerator that was not Sabbath friendly. A sculpture, a painting, a photograph, a melody can not be seen or heard until it is exposed to the public. So one may not sculpt, paint, take photos, or compose music on the Sabbath even if that person is no more than a casual hobbyist in the particular art. To these examples I respond as follows: We may agree that creating can involve bringing into being something that was not previously of the same form. But that’s a process that is very different from the one by which God created the universe. He took nothing (or possibly part of Himself) and made it into something. To call both processes by the identical name is careless, presumptuous, and dishonoring of God. The latter is true creating in the purest sense of the term, and the former is not; it is converting one form to another. As far as I can tell from the instructions in the Torah, here is the sole criterion – with at least one implied restriction -- for deciding which behaviors are permitted on the Sabbath and which are not: Those things you do as part of your daily work (your occupation), you may not do on the Sabbath. In addition, because the Sabbath is a day of rest, you may not pursue any physically strenuous or tedious activity. All other activities, you may enjoy. So if you watch TV or prepare TV programming as a function of your work, you may not turn on a TV on the Sabbath. If you use a computer as part of your daily work, you may not turn on your computer. If you use a vehicle during or for work, you may not drive on the Sabbath. If you are a rabbi, say, and you prepare sermons during the week as part of your responsibility, you may not prepare a sermon on the Sabbath for the next Sabbath (not withstanding the allowance for spiritual practice on the Sabbath). I believe the criteria I mention above would extend to some things that are normally permitted on the Sabbath. For example, if you are a reader of written material, say as an editor, during the week, you may not read on the Sabbath. If your work involves dealing with money (a bank teller or a retailer, as examples), you will not be able to touch money on the Sabbath. If you are a paid ball player, coach, or manager, you may not play ball or be involved in a ball game on the Sabbath. But since a ball game involves physical activity it may not be permitted by anyone. May we operate machinery, whether mechanical, electrical, thermal, or hydraulic? May we use tools? I believe there are at least two parts to the answer to these questions. First, in accordance with my criteria, if the function is associated in any way with your daily work, you may not do it. If you drive or ride in a car to and from work, you may not drive or ride in a car on the Sabbath. If you take public transportation to and from work, you may not do so on the Sabbath. If you use tools in your work, you may not use tools of any kind. However, some tools are allowed to everyone. Those are the tools that we employ in our daily living, such as spoons, knives, and forks (even if a chef), toothbrushes (even if a dental hygienist), combs (even if a hair stylist), scissors, and others. You get the idea, don’t you? Second, if the function requires unusual effort so as to detract from your resting, you may not do it. You may not personally move anything heavy – anything requiring exertion -- on the Sabbath. As one example, if you’re in a car on the Sabbath and a tire goes flat, you may not change the tire. However, you may call for assistance and have the tire changed, as long as the person changing the tire is not of your household and you do not pay him for the service (think the Auto Club). Now some Jews say that the Sabbath rest is to be in touch with the Lord all day. We must therefore do nothing that takes our mind off of the Lord. We may not distract ourselves from His presence in our lives. Once more I have to insist that this idea is in violation of Deut. 4:2 and 13:1. On the Sabbath, He tells us, we are to rest from the six days of our work. Nothing more! And He repeats this so that we will not be tempted to forget it and follow our own hearts (read “minds” here instead of “hearts,” because that is where the seat of thought was to the ancients). Moreover, if we are to love the Lord, our God, with all our heart, with all our soul and with all our might, why do we need a Sabbath especially for that? We must direct ourselves toward that ideal goal all the time, including the Sabbath. But if we are permitted to work for six days, that doesn’t mean we may ignore God during those endeavors. On the contrary, we must devote ourselves to reaching that goal more on those days than on the Sabbath. That’s because we are more distracted by our work. I next consider lighting of Sabbath candles, drinking wine, and the breaking of bread and their blessings -- Kiddush. For the reasons described below, I consider these practices as permissible, not mandatory. Although the Torah does not specifically prescribe it, I believe that lighting candles in the evening before the Sabbath is not only appropriate and desirable, but important, for two reasons. First, the Sabbath is a reminder to us (1) of Creation and (2) of our exodus from Egypt, the latter because we received the Sabbath commandment within days afterward. The first of these is the most important event for the world and humanity; the second is the next most important event for the Jewish people. When we light the candles in anticipation of the Sabbath we commemorate the light of Creation. The Lord often tells us that we need to maintain our attention on Him and His message by keeping reminders (see references later) before us. The lighting of Sabbath candles can be one of those reminders. Second, as we no longer have the Tabernacle/Temple, and the priesthood is inactive, we need to be reminded of the lamp stand that the high priest lit every evening in the Tabernacle. Our lighting of the Sabbath candles is our reminder of that procedure and its history. Incidentally, because the Sabbath doesn’t begin until the next morning, the candles may be lit at any time Friday evening. However, they should be lit as soon after sundown as is practical, for God instructed Aaron to light the menorah in the evening. We may also consider the lighting of candles every night as a reminder of the Temple lamp stand. We might even entertain the idea that oil lamps should be used instead of candles. I imagine any of these alternatives would be permissible. I personally, together with my wife, light the Sabbath lights soon after sundown and we use oil lamps that hold enough oil so they burn until early the next morning, as did the Temple lamps. As a final note, because part of the reason for lighting the candles is to remind us of the high priest’s responsibilities, the candles may be lit by either a man or woman. As for blessing the sacramental wine, there seems to be no reason based on Torah precepts for it other than it could be a reminder of the drink offering that accompanied most sacrifices. I am inclined to imagine that this tradition is an addition to the words of the Torah, which Moses cautioned against, and perhaps should not be practiced. However, the sweetness of the wine and its warming and heady afterglow is symbolic of the sweetness of the Sabbath rest. So in the same vein as for the candles (and later the bread), partaking of the wine is justified, although equally not necessary. It, like the candles, is not a new commandment or even an obligation. Anyone performing Kiddush must not do so out of obligation or guilt. One must perform it out of love for the Lord and with great joy. In fact, I may go so far as to say that is true for everything we do. Do it out of love for the Lord, and do it with joy. I am strenuously against the concepts of reward and punishment, but I have to admit, doing what I suggest here will improve your life more than you can imagine. I am equally strenuously for the idea of consequences. As for the blessing over challah, I believe that the bread is a reminder of the Tabernacle/Temple showbread and the meal offerings. This may be only partially meaningful, however, because the showbread might possibly have been unleavened, although this is not specified in the Torah. Nevertheless, blessing the challah is still a meaningful and worthwhile commemorative because it is a reminder of our ancestors’ meal offerings. The traditional blessings that accompany the candles, wine, and bread should also be reminders and address the nature of the rituals. Therefore, I believe the blessings should be altered to expressly mention the reminders, acknowledging that they are a fulfillment of the Torah passages instructing us to keep reminders before us. Here are some simple suggestions that I have come up with, although I believe the final blessings should be carefully considered by each of us. In my prayers I prefer the singular “I,” “me,” and “my” rather than the plural “we,” “us,” and ”our” because it stresses the personal relationship I have with the Lord. If each of the participants in the rituals does the same, the result is the “I” transorms into “we,” the “me” transforms into “us,” and the “my” transforms into “our,” so to speak. Two activities that are forbidden on the Sabbath are putting on phylatories (laying tephilin) and shaking the lulav and ethrog on Succoth. The rabbis have decreed that we may not lay tephilin or shake the Succoth fruit (ethrog)and four branches (lulav) for rather interesting and circuitous reasons. As near as I can understand, it goes something like this: The Sabbath is the ultimate honor to the Lord. Therefore no other honor should be offered on that day. Another seemingly circuitous reason is that we apparently can’t touch something on the Sabbath that has no purpose. So, since we can’t lay tephilin on the Sabbath, we are not permitted to touch them. I’m not sure what all this means, but this rabbinic logic raises some questions for me. First of all, does an additional means of honor diminish the Sabbath’s honor? Why can’t we give additional honor over honor? Nothing is diminished. It’s just increased. So is there a limit to the honor we afford the Lord? The Torah says nothing about this rabbinic reasoning. It’s man-made, and I would find it difficult to accept that the Lord communicated these ideas to the rabbis. Thirdly, is there anything written in the Torah that supports the rabbis’ logic? I believe the answers to these three questions is “No.” I see no valid reason to prohibit activities that give honor to the Lord. After all, we are not prohibited from sacrifices on the Sabbath. In fact, the Torah adds sacrifices on the Sabbath on top of the daily sacrifices. In other words, we are told in the Torah to add honor on the Sabbath. Therefore I claim that we may lay tephilin and shake the lulav and ethrog on the Sabbath. I believe the day should begin at first light and end just before the next first light, so we may not terminate our observance of the Sabbath on Saturday evening. The Sabbath (and incidentally, the holidays) does not end until just before the next morning. If we might arise before that time, we must still observe the Sabbath. On the other hand, on Friday evening and through that night, we may feel free to engage in normal activities. A night worker may work Friday night as long as he or she will return home before first light. However, if the Friday evening rituals were observed, it might be nice to quietly contemplate and look forward to the Sabbath rest. According to Exodus 12:1 and Leviticus Chapter 25, the year should not be defined in two ways, such as by agriculture and by calendar. They have to be the same year. God dictated to Moses that the month in which Passover occurs is to be the first of the year for us. The sages took an end run around this verse by claiming it was to be the start of the agricultural year, whereas the seventh month of the year (the month started with Rosh Hashanah) was the anniversary of Creation and therefore should be the first month of the calendar. According to a careful and incisive interpretation of verses in Leviticus 25, this is imaginative nonsense. The start of the seventh month is not the start of the year. I’ll start with exod. 12:1 and 2. Exod. 12:2 This month shall be the beginning of months for you. It shall be first in the months of the year for you. The ancient sages interpreted these verses in a rather strange way. Because the words “for you” appear in v. 12:2, they concluded the verse only referred to Moses and Aaron. They also explained that the words “in the land of Egypt” implied a loss of validity when they left Egypt. Therefore, the verse could be disregarded for the most part. But let’s now see what the Lord says in Leviticus. Here it becomes a little more complicated and the implications were apparently overlooked by the Talmudic sages. In chapter 25 of Leviticus, the Lord addresses the Sabbatical year for the land of Israel. Every seventh year was to be a Sabbath for the land. There was to be no planting or harvesting in that year. Nevertheless, what grew naturally was for food for the people for the entire year. Here are the first seven verses of Leviticus 25. Notice that v. 25:5 seems to contradict vss. 25:6 and 7. But we have to assume that the words for “reap” and “gather” in v. 6 are meant to be interpreted in a formal agricultural sense, that is, as a harvest. In v. 7 the wild growth is to be picked as needed throughout the year. After v. 7, the Lord addresses the Jubilee year, which follows the seventh Sabbath year in a complete Jubilee fifty-year cycle. Now the Lord tells us that no planting is to be done in that year either. So we have two years in a row without planting. Before getting to the meat of this discussion, I take a short digression to explain the planting cycles in ancient Israel. The winters were the rainy season. The summers were hot and mostly dry. So the major sowing season was in the fall. A secondary sowing time was in the spring when crops less thirsty would be planted. Most grains, vegetables, and fruits were sown in the fall, around the time of the sixth and seventh months, the months now called Elul and Tishrei. The early winter crops were harvested before Passover, and the later winter crops were harvested around the time of Shavuoth, in the months now called Nisan, Iyar, and Sivan. The secondary (spring) sowing occurred in Nisan and later. Spring-sown produce consisted of hardier and less thirsty grains and vegetables. This should give you a useful introduction for the rest of this discussion. Warning! Here comes the complicated part. In verses 25:8 to 25:19, the Lord addresses aspects of the Jubilee year. In v. 25:20 and following, He responds to an obvious question. Why does the Lord mention three years in v. 25:21? Well, there’s the seventh year, which is the Sabbath year when nothing is sown. Then there’s the Jubilee year itself when nothing is sown. And finally there’s the third year, the year following the Jubilee year, when sowing is permitted but a six-month period must elapse before the harvest comes in and fresh produce can be eaten starting at the beginning of the fourth year. This means that in the seventh year (land Sabbath) food comes from the wild uncultivated growth that follows after the end-of-sixth year harvest. In the next two years, the eighth and ninth, food that was stored up at the end of the sixth year is eaten. In the middle of that last year (in the fall) the new crop is sown. Now here follows the heart of the discussion, which is centered on the above three verses and the above paragraph. Remember the major sowing time was in the fall. The Lord says He will bless the crop of the sixth year. The crop of the sixth year is harvested in the spring, which is the end of the sixth year and the beginning of the seventh, the Sabbath year. So let’s examine the three years following the sixth. In the seventh year, all of the abundance of the sixth-year crop was stored. During the seventh year, the uncultivated growth was eaten. In the eighth year, half of the stored produce was eaten. In the ninth year, the other half of the stored food was eaten. In the middle of that year (the fall planting season), a new crop was sown. The bottom line? Each of the years mentioned in this discussion are years starting in the spring. No year started in the fall. The Lord calls each of these periods “years.” There is no mention of any other kind of year. Therefore, the Talmudic concept of a calendar year is unsupported by the Torah. It should in all honesty be abandoned. There would be no real hardship other than the new calendar would have to be explained, and who would declare what year it was? Any hardship that might arise would center around questions about the Kabbalistic explanation of the calendar year and the significance of the first two High Holy days, that is, the days we now call Rosh Hashanah. Before completing this discussion, I have to say something about how the “calendar” year most likely came about. From Abraham on forward I believe there was no formal calendar that the Jews followed. Only one month had a name at least in the Torah, the month of Aviv, the first month of years according to the Lord’s words. At first the Jews “counted” each year so that they knew when the seventh and the fiftieth years started. When the kings arrived on the scene, the Israelites “counted” from the start of a king’s reign. However, the Babylonians used a formal twelve-month lunar-based calendar. When the first Temple was destroyed and the Jews were taken into exile, they promptly encountered the the calendar of their captors. Soon assimilating, many of the Jews adopted the customs and practices of the Babylonians. Remember, they were in exile for four genrations. Among other practices, they adopted the calendar. The calendar that started in the Jews’ seventh month! And we’ve been saddled with an alien calendar ever since. When the first Temple was destroyed by the Babylonian king, Nebuchadnezzar, and most of the Israelites were dragged off into exile, the surviving spiritual leaders of the people probably believed that the nation was being punished for its numerous sins, as did the bible prophets. Worse yet, because the Temple was gone, they believed that God was no longer with them. The prophets of the exile reveal and echo these beliefs to us. The scholars of the time knew they had to resort to new and drastic measures to somehow preserve the Jewish faith without the Temple and living in a strange land. So they devised an ingenious set of practices and rituals to compensate for God’s absence and the loss of the Temple. But, ingenious as those leaders were, I’m convinced they led Judaism astray. Dread of the Lord’s anger must have been strong in them. In their eyes they had just been bitterly and severely punished. Rather than designing substitute ritual and practice to follow the Temple commandments as closely as possible, they concluded that the Levitical instructions were no longer valid. Of course, they could not make sacrifices without the Temple, for there is a commandment not to slaughter an animal suitable for sacrifice away from the Tabernacle/Temple (although violations of this commandment had been practiced by the Jews for centuries before the exile and continue to this day). But they also threw out the ritual commandments that were not directly associated with sacrifices. The priests and Levites, quite corrupt by the time of the exile, were disenfranchised, and prophets and sages, the elders, replaced them as spiritual leaders. Synagogue prayers were substituted for the sacrifices, and daily morning, afternoon, and evening prayers were instituted. The Torah code of conduct was reevaluated to account for the new circumstances, and probably because of their fear of God’s vengeance, the spiritual leaders incorporated new restrictions to try to force stricter observance by the people. I might also surmise that they concluded that much of the Torah was no longer as divine as previously supposed. After all, God had said that the Temple and the associated rituals were for all time. This didn’t work for them any longer. The tendency to further restrict presumed errant behavior intensified during various periods of suffering and hardships throughout the following centuries. Many of the sages and scholars of later generations would have readily presumed that those hardships were God’s punishment for the people’s Torah violations. It’s easy to imagine that in the aftermath of a particularly troublesome period, scholars would conclude that they had not been righteous enough. Not knowing specifically what they might have done to bring about their calamities, they would add additional restrictions. Thus I believe the following: What we know as Judaism today is the result of that process. So I want to second-guess the ancients. We may dwell on how they might have better restructured Judaism to more authentically preserve it and the laws of the Torah. The priesthood, corrupt as it was, should have been cleaned up and preserved. Offerings of goods, cash, even flour, oil, drink, first fruits where possible, instead of animals should have been encouraged. Synagogues should have been run more like the Tabernacle or the Temple, with priests and Levites in attendance with responsibility for conducting the rituals and practices of the synagogue. Naturally, far fewer priests and Levites would have been required as there were no sacrifices to deal with. Judges should have been appointed on a rotational basis to oversee the synagogue activities and deal with complaints from the congregation. An equivalent - not a replica -- of the Temple lamp stand should have been maintained by the priests, as the ark with its Torah was and is. By the way, the ark and the lamps should have been behind a veil or wall so as not to be visible or accessible to the congregation. That’s the way they were situated in the Tabernacle/Temple. Only the chief priest of the congregation should enter that area. Two short daily services to replace the regular times of sacrifices should have been implemented. Observance of the festivals should have been patterned after the pertinent Torah instructions to the maximum extent possible. And the interpretations of all the Torah laws should have been examined with the intent to make them less severe so as to conform to the wording of a command and inspire the loyalty and observance of the masses, and their belief in and love and reverence for God. A tithe for the priests, Levites, the poor, the orphan, and the widow should have been continued as possible. Recognizing that the Lord had dictated tithes and sacrifices according to the ability of the offerer (Levi. 5:6, 5:7, and 5:11, for example), the elders should have arranged a system of tithes in accordance with that recognition. However, as the Lord reveals to us in Exod. 25:2 and four other verses, they should have stressed that the tithe would be accepted only from those who gave willingly (that is, with joy and without reservation). They should have stressed the Lord’s love instead of His “punishment” and the people’s love and reverence for God instead of fear. There should have been only two daily services. After all, if the prayers were a substitute for the sacrifices, the dictated sacrifices were to be brought in the morning and in the evening, except for ad hoc voluntary sacrifices brought for atonement, thanksgiving, or special circumstances. For these, the priest(s) and Levite(s) had to be in attendance throughout the day, everyday. Therefore the synagogue should be open and welcoming at all times for sinners and “righteous” alike. Although prayers were chanted daily, the Torah should be recited only at the festival of Succoth in every seventh year as specified in Deut. 31:9 to 31:13 (although in Deut. 31:13 we are told that this should be practiced only in the land of Israel). The Torah should be read slowly, not in haste, in both Hebrew and the native language. Haste in the reading must be considered inappropriate. The prayers to be recited should also be recited slowly. The hasty recital of prayers seems to have arisen over time as the prayers were gradually expanded. Expansion of the prayers should have been discouraged, as it can be thought to reflect a requirement for extra uncalled-for sacrifices, which is not of the Torah. I believe a Jew may pray on his or her own. I believe that when we are too far from a synagogue or have insufficient time to attend a community service, we may pray on our own. But when we are able, we should make a thanksgiving or guilt offering to a synagogue. When we do pray we should kneel and touch our faces to the floor in reverence for Whom we worship and stand before. At such times we may pray what is in our hearts -- no memorized hastily recited words -- in any language. But Hebrew, if possible, would be good. No minyan is necessary. The Torah nowhere dictates a minyan. Twelve spies may have been necessary to examine the land of our forefathers, but even they disagreed, and ten of them inappropriately carried the moment. Why should this translate to a prayer minyan? Now for centuries scholars, sages, and rabbis have told us to face toward Jerusalem while praying. Well, if you believe we should not only face in its general direction, but we should look directly toward the holy city. 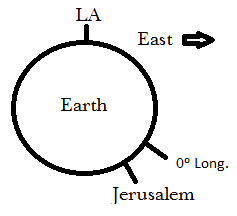 For example, from Los Angeles, Jerusalem is 3 degrees south and 153 degrees east. From New York, Jerusalem is 9 degrees south and 110 degrees east. From London, Jerusalem is 20 degrees south and 35 degrees east. Here’s a picture of Los Angeles to Jerusalem to illustrate what I mean. If you’re in Los Angeles and face east, look to the right by just a few degrees, and look down about 160 degrees, you’ll be looking toward Jerusalem. Here’s how to approximate looking 160 degrees down. Sitting upright with a straight back, look between your thighs at the front edge of your seat. That should be about 160 degrees down. However, if you believe as I do that God is all around and in us and throughout the universe, then there’s no reason to face east (toward Jerusalem). God is here. From these three verses, we can conclude that trumpets should be blown by the priests at every service, including Sabbath services, when tithes are collected. Notice that this requires us to carry money or other forms of tithe on the Sabbath day, but only for the giving of tithes. And this is in accordance with various Torah verses that describe the sacrifices that were offered on Sabbaths. The tithes and offerings should be collected at the beginning of each service. A so-called “eruv” (a continuous wire surrounding the neighborhood) is not necessary for us to be able to carry items of worship to synagogue. In addition to all the foregoing, Torah study should be conducted in every Synagogue so that each congregant comes to know and understand that the Lord loves him or her, plus all that the Lord desires of us. Possibly this study should precede or follow regular services. Jewish history should be offered as well, emphasizing both the good we have accomplished along with the accounts of our victimization. Also, parts of the tithes that are in the form of food and drink should be consumed by the synagogue officials and the congregation after each service. What is left should be for the priests and Levites -- and their families. We need new less extensive prayer books. They should be printed in Hebrew and the native language. Prayers should not be repetitive. They should be chanted only once. This alone may be enough to shorten the service so that speed is unnecessary. In any case, the service should be short enough to not be inconvenient or too short. But the primary concern should be the speed with which the service must be performed. Every word must be chanted distinctly and slowly so that it is understood and heard by all the congregants, and so the name of the Lord is not taken in vain. One more important point, that regarding Yom Kippur service: We are told to afflict our souls on that day. The sages, prophets, and rabbis have taken that to mean fasting from food and water for up to 27 hours. I’m not sure that fasting is what God intends, but it is still reasonably appropriate. However, if we are to afflict our souls, why do we dress up in our best finery on that day? Wouldn’t sackcloth and ashes be more approriate as we afflict our souls? So I propose that the Yom Kippur service be observed with true humility, fasting of the soul (that is, denying our desires), and passionately seeking penitence. I believe that would be a Yom Kippur the Lord desires of us. Before we leave this discussion, I want to add somethings the Lord has had me thinking about lately. It relates to the position and responsibilities of women. First I have to digress momentarily to describe why I believe what I will be saying here. When Moses addresses his audience in the Torah, he is speaking usually to a group of indiviuals, occasionally only to one person (such as Aaron or one of his sons). Well, the second-person pronouns, you, your, and yours, portray number and gender in their spelling. However, if the crowd being addressed is mixed (men and women), the pronouns are spelled to indicate masculinity. This does not mean that only the men were being addressed. Thus they do not preclude women from observing the commandments so commanded. In fact, they are included, not ignored. It was the priests, sages, and Talmudists who ignored them. Only when Moses explicitly and obviously addresses men (such as in circumcision) are women excluded. In addition, women are excluded from the priesthood and from the Levitical work in the Temple (and in synagogeues if priests run them as I suggest). Why is this so? Well, because where the priests are concerned, Moses spoke to Aaron or to the sons of Aaron, not to the children of Aaron. Therefore, women may not be priests. Additionally, women may not do the synagogue work of the Levites because the Levites were chosen by God in place of every first-born male. Therefore the Levites serve instead of the first born son, not the daughter. The kosher laws fall into three categories, separation of meat and milk, the animals that are kosher to eat, and foods and nonfood products that are processed. All the kosher laws are based on two parts of the Torah plus additional rabbinic pronouncements. The first category of the kosher laws in the Torah is presented in three verses, Exod. 23:19 and 34:26 and Deut. 14:21; the second category appears in Levi. 11:3 to 11:31 (and is essentially repeated in Deuteronomy 14). We will consider the sources of these two categories in turn. Exod. 23:19 and Exod. 34:26 are identical in both the Hebrew and English, so only the first verse is offered here. The juxtaposition of the two statements in Exod. 23:19 is strange and not understood. What could the first fruits of the land have to do with the sacrifice of an animal? In Deut. 14:21 there is also no obvious connection between the first and second statements. I have to note as an aside that there is no separation of verses in the written Torah. Except in fairly uncommon instances, one word follows another with no indication of start or finish of a verse. So the two separate instructions in each of the three verses were actually probably meant to be separate thoughts. However, this doesn’t change the tenor or outcome of the discussion. Interestingly, the association between the instructions of the former two verses might be easily dismissed except for the fact that Exod. 23:19 is repeated precisely in Exod. 34:26. Aside from a few well-known examples, precise repetitions of verses are seldom encountered in the Torah. Most often something in the Hebrew is altered in the repetition. Not here! The two verses are completely identical to the letter. That might mean something. But what is it? The surrounding verses in both cases in Exodus seem to provide no clues to the answer; they are similar. They refer for the most part to appearing at the Temple for the three festivals and the attendant sacrifices. In the case of the verse in Deuteronomy, the context relates to kosher and non kosher animals; what can be eaten and what cannot. Therefore the second part of all three verses must be understood outside the context. Deut. 14:21 offers an extra hint, however, into the possible meaning of the statement in question. It begins with “Because you are a holy people, ….” Now the word holy means two interrelated things. First it means to be separated, but it also means to be dedicated, devoted, or consecrated for a divine purpose. Because we are separated and dedicated for a divine purpose, we may not mix meat and milk? That makes little sense, biblical or otherwise. But to be sensitive to the feelings of a holy animal should indeed be an uncommon attribute of a holy people. Incidentally, most – if not all – translations of these verses say something like the following for the last statement: “You shall not cook a kid in its mother’s milk.” As far as I am concerned, the two translations are equivalent, but the translation I provide gives a greater hint as to the possible meaning. I believe the meaning is that a sacrificial animal or an animal to be slaughtered for food may not be removed from its mother while it is suckling. It has nothing to do with separation of meat and milk. It has to do with not causing unnecessary anguish to the mother. Moreover, in the case in which the verses refer to sacrifices, there is another problem with the traditional interpretation. How might it be possible to cook the kid in its mother’s milk? Why such a prohibition? The mother and its offspring are not to be slaughtered in the same day (see below). If the mother is slaughtered the day before, her milk would not be available. If she were to be slaughtered the next day, why would her milk be used to cook the kid? It makes little sense either way. Traditional interpretation of these verses is that milk and meat or any products derived from them or utensils touching them are not to be mixed together. In Exod. 22:29, God tells us that on the eighth day the first born of any animal is for the Lord. No animal could normally be weaned at that age, because its digestive system is not yet capable of accommodating anything other than its mother’s milk. However, as the animal will not be living any longer than at most one day, why think about its digestive capability? So another possibility for what this part of the verse may be saying is that the animal should not be sacrificed until it has digested its mother’s milk. In other words, wait a reasonable time after removing the animal from its mother’s teats. Now why is the traditional interpretation better or more valid than these possibilities? There is no elucidation of this verse anywhere in the bible. On the other hand, there are other verses in Leviticus and Deuteronomy which contain commands about mothers and their babies that are consistent with my interpretation. For example, we are told in Levi. 22:28 not to slaughter a mother and its offspring on the same day. For another example, a mother bird sitting on a nest must be driven away before taking its eggs or its chicks (Deut. 22:6 and 7). Thus you do not allow the mother to witness the demise of its young -- or its removal while it is still with milk. To my way of thinking, my interpretation of Exod. 23:19 is amply supported by these verses in Leviticus and Deuteronomy, while the traditional interpretation is not supported anywhere in the bible. In fact, I take my critique one step further: To interpret these statements as requiring a total separation of everything dealing with meat and milk in general is a great stretch of the literal meaning and its spirit, and can be construed (and is by me) as a violation of Deut. 4:2 and 13:1. Furthermore, I wonder when the separation of meat and milk was instituted. Abraham served the visiting angels meat to eat and milk to drink (Gene. 18:7 and 8). If the practice was not started by Abraham, nor by Isaac or Jacob, it certainly wasn’t instituted in Egypt. Where and when did it begin? Are there any records about this before the Babylonian exile? The bible contains no references to the practice. In fact, the scribe of Genesis 18 didn’t seem to be aware that Abraham was performing an act that would later in the scribe’s time be prohibited. This is very atypical of the scribe’s practice in the rest of the Torah. Now we can’t be sure when God gave this charge to Abraham. He doesn’t tell us that. So we have to make an informed assumption. My guess is that it happened when God changed Abram’s name to Abraham, in Gene. 17:5. There seems to have been no opportunity for it to have occurred later. But Abraham fed the angels in Genesis Chapter 19, so if I am correct, Abraham knew about the commandments by then. So a conclusion that the last parts of Exod. 23:19 and Deut. 14:21 mean not to mix meat and milk would have to be wrong. There’s still more: What makes milk different from meat? Why should they be separated? Milk is, after all, an animal product. It contains many of the proteins and most other components present in meat (bones are the exception). It even contains blood and fat cells. The primary difference is that milk is more liquid and meat is less liquid. Is that a real difference? Is not flesh mostly water? The difference is in the percentages of solid and liquid in each. Milk is over 99% liquid and meat is about 70% liquid. How does that make them sufficiently different that they must be separated? Note also, that poultry was at one time not considered meat and could be mixed with milk. This was because hens did not give milk. However, in the ninth century of the Common Era the rabbis decided that poultry was also meat. If the definition of meat is so arbitrary, is not also the definition of milk? The consequence of this argument, if ever accepted, is enormous for Jews. The second category of the kosher laws, which is the list of animals that are suitable and unsuitable for food, is based on Levi. 11:3 to 11:31. These verses exhaustively list the animals that are considered kosher and those that are not. The rest of Leviticus 11 (sixteen more verses) deals with the consequences of contact with or of eating prohibited animals. I have little to add to the traditional interpretations of these verses other than to remark that the identification of some of the animals listed is uncertain. The meanings of some of the Hebrew names are obscure, and they have been surmised. Many of the words appear no where else in the bible or other ancient literature. Nevertheless, the permissions and prohibitions are fairly well laid out and must be adhered to. The third major category of the kosher laws deals with packaged and processed foods and fluids and other nonfood products. These items may be considered kosher by rabbis if they have no ingredients derived from non kosher sources and their processing is supervised appropriately. A few of the foods included here are bread, cheese, wine, food coloring and preservatives, and cleaning products. There are hundreds of items on kosher lists. And there are even more for Passover, which has its own kosher restrictions based on Torah passages dealing with leaven. I have two critical remarks about the last two categories of kosher law, kosher and non kosher animals and products from non kosher sources. For one, relating to kosher and non kosher animals, I believe that it is impossible to be completely free of “eating” non kosher animals. Modern science has discovered that odors are the result of so-called pheromones, molecules that emanate from the interior and exterior of animals, vegetation, and non-organic materials. When we smell anything, our nostrils and mouth receive its pheromones and we inhale and ingest them. As a modern example, when we pass close to a restaurant from which the smell of cooking meat accosts us, we can’t help but ingest something that came from the meat. If the meat is non kosher, we have inadvertently violated at least one of the verses in Leviticus 11. This may be one of the reasons why we are told to atone for violations that are not known by us. It is also a reason why we cannot escape from being sinners. For this reason and others, I believe we should be constantly asking for God’s forgiveness for our human fallibility and bringing sin offerings to the Synagogue. Gelatin comes from the collagen in cow or pig hides and bones, hooves, and connective tissues. It is produced in a variety of ways, depending on its source and intended use. Because it comes from non kosher animals, it is considered non kosher by Jews. However, a funny thing happened on the way to the forum. Kosher gelatin! What is kosher gelatin? This substance is made from kosher cow bones and hides. The remarkable thing about it is that although it is derived from a meat source, the process of manufacture is said to change the result enough so that it is no longer considered meat. It is certified “pareve,” that is, neither meat nor dairy. Now I ask: Why could meat become pareve but a non-kosher product can’t lose its non-kosher label when it goes through the identical production process? The answer? The product and its manufacture have to be certified kosher by a rabbi. The rationale in this quote has two horns (like bull?). One is that hide and bone are not flesh. That’s downright peculiar. Would a rabbi permit me to dip cow hide or bone into my milk? Never! The logic of the quotation is warped. There has to be a better alternative than this rationalization before I will accept a statement alleged to be fact. The other horn of the rationale is that the product undergoes so much change that it becomes disassociated from its source. Why is not this statement and its rationale equally applicable to gelatin that is not considered kosher? I guess the bottom line is this as dictated by the rabbis: If a product comes from a kosher source, no matter what process the product goes through, it will be kosher at the end. If it comes from a non-kosher source, no matter what process the product goes through, it will be non-kosher at the end. No arguments and no questions! The following is a brief description of the five steps involved in making pareve, kosher gelatin. "Achshevay" and reinstitutes gelatin into a food category. with many other ingredients, it is not fleishig. "taam kalush" (a weak flavor), and is not fleishig, due to the major change it has undergone. Does any of the above sound logical? For one thing, 1) a substance that is food is somehow rendered unfit to eat? How? By a process of chemical decomposition (all sources of any gelatin undergo a similar process). Nevertheless, 2) people eat it in food, which makes it a food again. Then it suddenly loses its status as a meat product and becomes pareve because 3) people don’t eat it by itself. But 4) it is not a food after all, but a food stabilizer. Finally, it’s not non-meat because people don’t eat it by itself, but because 5) it has a weak flavor and has gone through major changes. Last of all, if it’s derived from a kosher source it remains kosher, but if it is derived from a non-kosher source, it remains non-kosher. Unequivically! What can I say to counter such a persuasive argument? Cheese is made by curdling milk. The curdling agent in the past, aside from weak acids such as vinegar that start the curdling process, was almost entirely rennet, an enzyme extracted from the stomachs of calves, kids, or lambs. The type of rennet found in each of these animals is specific to the species, and permits digesting the milk of the animal’s mother. Each imparts a different character to the final cheese product. The sources and processes by which rennet is produced vary, depending on the type of cheeses desired and where the cheeses are manufactured. The most prevalent modern method, used throughout Europe and other parts of the world, is as follows. Deep-frozen stomachs are milled and put into an enzyme-extracting solution. The crude rennet extract is then activated by adding acid. After neutralization of the acid, the rennet extract is filtered in several stages and concentrated until it reaches the required potency. One kg of rennet extract contains about 0.7 grams of active enzymes – the rest is water and salt and sometimes a preservative. Typically, 1 kg of cheese product contains about 0.0003 grams of rennet enzymes (a ratio of about 3 million to 1). Notice the similarities between rennet and gelatin production methods. They both go through extensive chemical and physical processes to achieve extraction from the source material. While the above described process is still used somewhat widely, the modern American (and British) process of producing rennet is very different. It does not depend on an animal source. It uses vegetable sources instead. Nowadays genetically engineered bacteria, fungi, or yeasts are used to produce the necessary rennet enzymes. In 2008, approximately 80 - 90% of commercially made cheeses in the United States and Great Britain were made utilizing this form of rennet. So why is uncertified cheese not kosher? Only because it doesn’t have the rabbinic seal of approval. The rabbis say this certification (and required supervisory oversight) is necessary to insure that no foreign or non kosher food ends up in the cheese during its processing. This would be a fairly valid argument except for what the Torah tells us in Deut. 2:6 -- which I will get to below. Deut. 15:21 “But when there will be a blemish in it, lameness, or blindness -- any ill defect -- you shall not sacrifice it to the Lord, your God. Now Deut. 15:21 is more than interesting. It is illuminating. Moses says “…lameness, or blindness -- any ill defect…. !” From this verse, it sounds like perfection is not necessary; only that the animal must be free of any visible major defect. Such a defect would be something readily apparent to even perhaps a casual observer. Close examination (except possibly for skin problems) by an expert should not be required. In Deut. 17:1 “a spot of any sore thing” is mentioned. Next we examine Deut. 12:15. The message of the verse starts two verses earlier and I repeat them here to provide context. From these verses we learn that sacrifices are not to be made outside of the Temple (vss. 12:13 and 12:14). Of course this admonition was ignored by the Israelites. Certainly after Israel was divided into the northern and southern regions (soon after Solomon’s death), sacrifices were the norm in the northern kingdom of Israel in Shiloh and other places because Jerusalem and the Temple were in the southern kingdom of Judah or Judea. But we also learn here that animals could be slaughtered for food and eaten within any cities and homes “… like the gazelle and like the hart,” because they were not animals intended for sacrifice. This also means to me that sacrificial animals can be eaten if they have a blemish and are unfit for sacrifice. Well! What does this say about rabbinical inspection of animals for slaughter? It isn’t even necessary. Furthermore, in Deut. 2:6 we learn that we are not even supposed to be exclusive in acquiring some of our food. The people we were permitted to buy food and water from when we were in the wilderness were the children of Esau. We see here new information that had not been mentioned before in the Torah. This verse provides some interesting insight. Not only did the Israelites eat manna and quail. They also may have bought food and water from their cousins, the children of Esau, the Edomites. Now what do modern rabbis and scholars have to say about that revelation? Israelites, a holy people, buying food from another people without rabbinic supervision! Sacrilege according to halachah! For all the above reasons, I am prompted to question some (many) of the kosher laws, believing them to be ambiguously supported, overly strict, and disturbingly complex. I suspect they came about in the process I described earlier, out of fear, distrust, and greed. To me, these laws are extensions of Torah and are therefore forbidden by God in the Torah (see Deut. 4:2 and 16:1 above). Before we leave the subject of the Kosher laws, I believe it is appropriate to consider another aspect of Jewish law, and that is the matter of “clean” and “unclean,” but only as it applies to food and food-processing utensils. Leviticus 11 is the basis for much of the following discussion. This chapter deals with animals and insects that are permitted to be eaten and those that are not permitted to be eaten. It also deals with situations leading to being unclean and its consequences. When something becomes contaminated by an unclean creature, that something must go through a specific process in order to become clean again, if that is at all possible. For example the Lord tells us in the Torah that the carcasses of all animals and insects that died of causes not related to eating the animal’s flesh, whether kosher or not, are unclean. And when something unclean touches something clean, the clean becomes unclean. Most unclean things may become clean once evening has arrived. Some unclean things must undergo some process in order to become clean in the evening. And the process is not complicated. It involves washing the unclean thing, sometimes in living (running) water. Nothing more.